Gamers will be able to pick GOG's Ubisoft library at a 60 percent discount until Monday, November 4th. Ubisoft has been around for close to three decades at this point and, as you might expect for a company of its age, has played host to more than a few classic games in its time. That being the case, if you're a fan of Ubisoft and its various franchises you might want to pay a visit to GOG this weekend where you'll find the publisher's properties on sale at a 60 percent discount. The site's Ultimate Ubisoft promo will include games of all stripes from RPGs like the Might and Magic series to strategy games like Panzer General II and shooters like Rainbow Six. Fans of platformers will also find something to love in the discounted Rayman games. 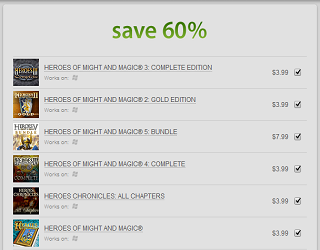 The sale will also include more recent titles like Assassin's Creed andFar Cry 2. As per GOG's standard, the discounted selection will, of course, come packaged with nifty extras and be completely DRM-free. If you're feeling particularly spend happy you can pick up the site's entire catalog, counting 44 games in total, for just under $165 dollars. Personally, I won't be going that route but there are a few gemsI'm considering. I've been eying the dungeon crawler Anvil of Dawn for some time now and a part of me feels like this might be a good time to find out why there's such a hubbub about Beyond Good and Evil. Take a look at the discounted games and let us know if there's any that strike your own fancy.